Contractors for a quarry firm say most of the slide will wind up in its mined-out pit, but an independent expert warns the slide could go crashing into Interstate 82 and the Yakima River. An expert in the geology of Central Washington warned Friday that a landslide from Rattlesnake Ridge near Yakima could be much more destructive than government officials project, slamming into Interstate 82 and the Yakima River. Bruce Bjornstad, a retired geologist from Pacific Northwest National Laboratory and an independent consultant, said a past landslide nearby appears to have spread quickly and covered much of the valley floor. But other geologists, including an engineering firm hired by the quarry where a large crack first appeared in October, say any slide is likely to be slow-moving and mostly contained by the mined-out pit, sparing the freeway and river. The difference in scenarios hinges on which direction the hillside will fall when it collapses, which seems increasingly likely as the crack continues to grow and widen. In addition to threatening roadways and the river, a slide could potentially bury a cluster of homes housing more than 50 people, most of whom have evacuated. Cornforth Consultants, a geotechnical engineering firm hired by quarry operator Columbia Asphalt and Gravel, says the hillside is likely to slump to the south, which would mean much of the debris would be trapped in the pit. That projection is based on monitoring, computer modeling — and years of experience with landslides, said Charles Hammond, an engineering geologist for Cornforth. Rattlesnake Ridge is made up of thick layers of basalt, interspersed in some places with weaker sediment layers, Hammond explained. The rock layers are tilted to the south, toward the quarry pit, and the angle is a fairly shallow 10 degrees — which is why his team doesn’t believe the slide will roar off at high speed. Based on measurements of the widening gash that now cuts across the ridge, Cornforth estimates the slide will break off in early February. The mass, which is moving about 1.4 feet a week, contains about 4 million cubic yards of rock and soil. Bjornstad, however, who has studied slides in the area for decades, is convinced the western flank of the slope will break off and follow a trajectory straight into the freeway and river. He points to the huge fissure that has propagated up from the quarry — and which he predicts will continue to grow. Those cracks extend deep into the hillside and cut across the basalt layers, he said. A similar landslide occurred a scant 20 miles away, when Toppenish Ridge slumped into Toppenish Creek thousands of years ago, he said. “It looks like it occurred very quickly,” Bjornstad added. A fast-moving slide that crosses the freeway and river is a worst-case scenario, Bjornstad acknowledged — but one he thinks officials should plan for. It’s also possible the hillside will slump, then stabilize, until a trigger like heavy rain or an earthquake causes it to move, he said. That geologists can come to such opposite conclusions shows how hard it is to predict the behavior of a massive, unstable pile of rock and dirt, said Tom Badger, a retired engineering geologist for the Washington State Department of Transportation (WSDOT). 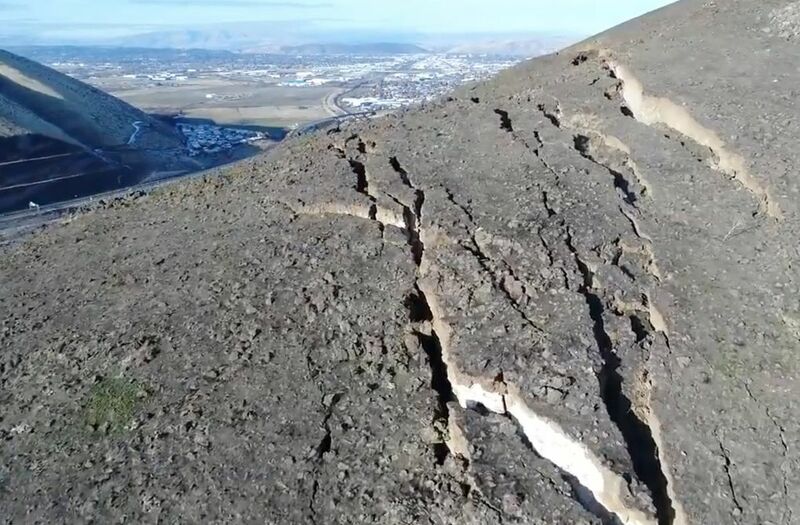 State Geologist Dave Norman, of the Department of Natural Resources, said officials have been monitoring the crack for months and considering a wide range of scenarios. So far, all of the motion and rockfalls have been in a southward direction, toward the quarry, he said. There is concern that some material, but not the bulk of the slide, could fall onto the interstate, Norman said. To protect I-82 from small amounts of debris, WSDOT this week began setting up a 600-foot-long barrier made of concrete-filled shipping containers. WSDOT is also conducting laser scans, called lidar, of the western face of the ridge to see if it is deforming under the strain, Norman said. The fact that the landslide is threatening a slope where gravel mining has been underway for years raises obvious questions about cause and effect, said University of Washington geomorphologist Dave Montgomery. An October analysis by Cornforth said the toe of the slide appears to be in a recently excavated area, and that removing weight from a rock wedge might have contributed to movement within a slide zone. This is the second time in the past decade that quarry mining has been underway in an area prone to landslides. 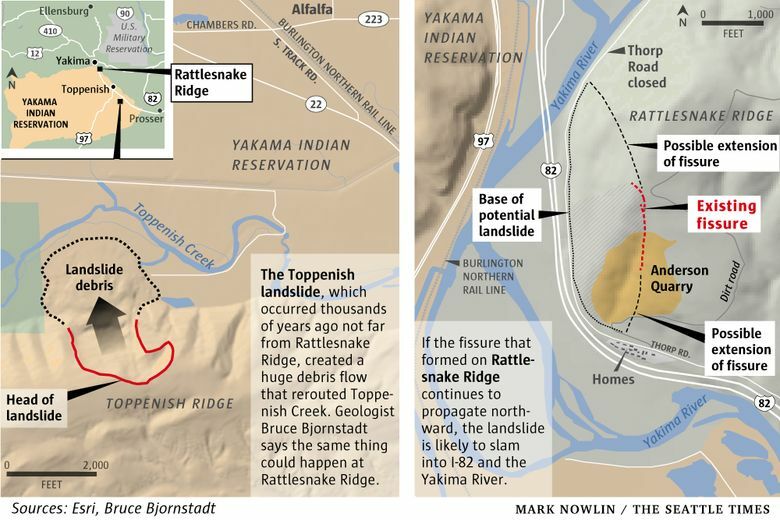 On Oct. 11, 2009, one of Washington’s largest landslides cut loose in Yakima County’s Nile Valley. That slide destroyed part of Highway 410, buried one house, damaged four others and triggered a costly flood from the Naches River. No one was killed or injured. That Nile Valley landslide involved tens of millions of cubic yards of debris. That’s a much bigger slope failure than is likely at Rattlesnake Ridge. State officials say there also have been big differences in their relations with the quarry operators. In the Nile Valley, state officials repeatedly clashed with Simmons & Son Hauling & Rock Crushing over mining activities that risked further destabilizing slopes. Less than one month after the huge slide, Simmons sought to resume operations. That prompted the Department of Natural Resources to issue a Nov. 4, 2009, emergency order to suspend the mining operation at the base of a talus slope. Such activity could increase the risk of restarting the slide and put more homes in danger, the order stated. Simmons contested that order through an administrative process that stretched until 2016, when an agreement was reachedcalling for the shutdown to become final. Tony Allen, a WSDOT geotechnical engineer who reviewed that report, said the Nile Valley slide had groundwater pressures that contributed to the instability. He said Rattlesnake Ridge is in a drier formation and would be less likely to experience a fast-moving landslide. Information in this article, originally published Jan. 6, 2018, was corrected Jan. 6, 2018. A previous version of this story gave the incorrect name for the waterway affected by a landslide thousands of years ago.